Eternal Journey: New Atlantis was available as a giveaway on March 15, 2015! Travel from the deepest trenches of the Atlantic Ocean to the awe-inspiring wonders of Mars as you solve the greatest archeological puzzle known to man: the origin of Atlantis. Begin this epic sci-fi journey in the present as you guide Amrite Stone on her latest dig, and then continue it 150 years in the future when she wakes up from cyro-sleep following an unexpected tragedy. 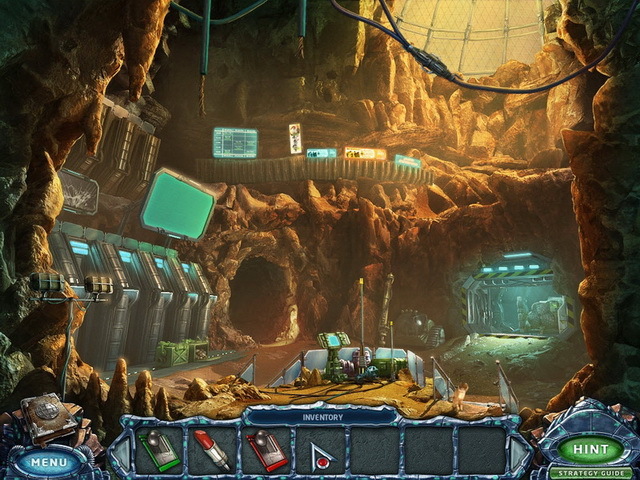 As you explore the scientific installation, you’ll use video clips and journal entries to piece together the events that resulted in the disappearance of every human from the base, befriend a lonely cat and encounter an alien life form more terrifying than man has conjured in his most outlandish tales of the future. 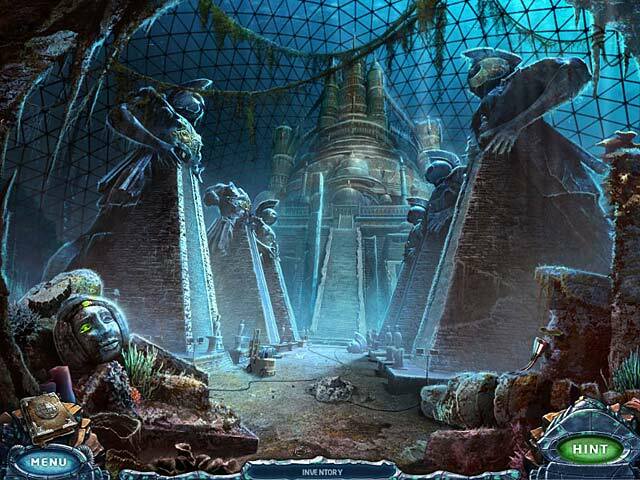 Through stunning production values and cunningly designed puzzles, Eternal Journey: New Atlantis will draw you into an experience unlike any other hidden object adventure! How would you improve Eternal Journey: New Atlantis? Lives are on the line as you race to keep a young boy with psychic abilities from falling into the hands of an evil politician. 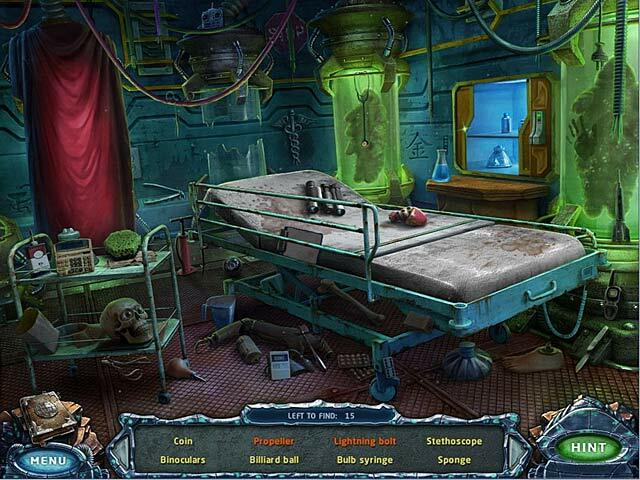 With its mind-bending puzzles and thrilling chases, Paranormal Pursuit is this year's most exciting adventure! Get ready for the fur to fly in this wild and crazy matching game! With dozens of challenging levels, bright and colorful graphics, and a storyline that will have you squawking with laughter, Cats. vs. Feathers will provide hours matching fun! Thanx WR, will do when I get back to the States. Finished the game and looking forward to the next chapter, which is teased at the end! Well, seeing as I got no response at all to my query re: the Digital Memory Boards, I've just played the game through again, and this time collected all of them (the one in the Control Centre was particularly difficult to spot! ), but much to my disappointment, it seems it was all to no avail. There seems to be no incentive to take the time to look for them because there wasn't even so much as bells or whistles to mark the achievement, much less any bonus extra gameplay as a reward. Shucks! Thank you for your feedback Sunnaze ( and from your previous comments too). I've been really busy of late. We have a French exchange student coming in less than two weeks and have been trying to get the unfinished parts of the house completed in time so that the house looks presentable and so that she has her own room. Finishing off the builders work, looking for floor tiles, wall tiles and wallpapers, then painting and decorating and shopping for new furniture has taken up a lot of my weekeds over the past several weeks. More so this weekend as we only have one more weekend beofre she arrives and there;s still so much to do. It's rare that I miss replying to community members comments, especially ones where its obvious they have made an effort like yours, so I apologise for missing them. There was one part of the day where there were too many posts to cope with. Time was limited, so I just allowed all of the posts through moderation enmass without really checking them properly. Well, seeing as I got no response at all to my query re: the Digital Memory Boards, I've just played the game through again, and this time collected all of them (the one in the Control Centre was particularly difficult to spot! ), but much to my disappointment, it seems it was all to no avail. There seems to be no incentive to take the time to look for them because there wasn't even so much as bells or whistles to mark the achievement, much less any bonus extra gameplay as a reward. Shucks! ............................Moderator Comment.................................... Thank you for your feedback Sunnaze ( and from your previous comments too). I've been really busy of late. We have a French exchange student coming in less than two weeks and have been trying to get the unfinished parts of the house completed in time so that the house looks presentable and so that she has her own room. Finishing off the builders work, looking for floor tiles, wall tiles and wallpapers, then painting and decorating and shopping for new furniture has taken up a lot of my weekeds over the past several weeks. More so this weekend as we only have one more weekend beofre she arrives and there;s still so much to do. It's rare that I miss replying to community members comments, especially ones where its obvious they have made an effort like yours, so I apologise for missing them. There was one part of the day where there were too many posts to cope with. Time was limited, so I just allowed all of the posts through moderation enmass without really checking them properly. A day late on this, I know, but just a few thoughts. The game is science-fiction, and it's more puzzle/adventure than HOG, and that's a good combination as far as I'm concerned. I'd agree with the comments that it's a bit too easy, though I reckon I'm only about halfway through. Graphics are good, almost with a retro-SF feel and the music isn't too generic or intrusive. As always with me I could do without the hidden objects, but it is a HOG, after all. My main point was to say that I think the Collector's Edition is well worth the download if it's still free from MyPlayCity (I haven't checked). There are ways round the splash / browser change screen and the webpage commercial at the end, and the extras do improve the game. A day late on this, I know, but just a few thoughts. The game is science-fiction, and it's more puzzle/adventure than HOG, and that's a good combination as far as I'm concerned. I'd agree with the comments that it's a bit too easy, though I reckon I'm only about halfway through. Graphics are good, almost with a retro-SF feel and the music isn't too generic or intrusive. As always with me I could do without the hidden objects, but it is a HOG, after all. My main point was to say that I think the Collector's Edition is well worth the download if it's still free from MyPlayCity (I haven't checked). There are ways round the splash / browser change screen and the webpage commercial at the end, and the extras do improve the game. Thank you again for another wonderful HOG. My wife cannot get enough of these! And like was mentioned in the reviews, the production values are high on this one. There has been some brilliant and original indie games released over the past several years that we never see here on the giveaway project. Gish is one of my favorites, a platformer with a greta art style and a reasonable, but not impossible challenge. It also comes with a basic level editor so that you can create your own levels. If you have a Steam account, I think I have a spare code that I could give you for Gish. Send me a friends request (and let me know your Steam name via the giveaway PM's) as I tend not to accept requests at the moment. Thank you so much for all the freebies you offer. Installed on Win7 32 bit with no problems :) and runs beautifully. I am enjoying this game so much. Thank you again for the high quality you find. It is greatly appreciated. Hi there Thank you so much for all the freebies you offer. I especially like this one :) Installed on Win7 32 bit with no problems :) and runs beautifully. I am enjoying this game so much. Thank you again for the high quality you find. It is greatly appreciated. Excellent game. I bought it two years ago and it still is one of the better ones. Still hoping for a continuation, though. I gave up with this game - can't pass through the extract archive stage (says always corrupt) and I don't know why, no errors, no details, except the one I mentioned, so I have no clue where is the conflict here, but I'm almost certain it is not my antivirus software since it was disabled and also due to *successful* activation stage it is even more mysterious thing for me. Probably I need to try next game to check general usage. I don't really want to try the safe mode installation - it is annoying to do, even is this can or not work. This is a comment just for you Stephen. Sorry I'm so late with it. The Giveaway pack wrapper was ver. 1.0 instead of the normal 2.0 with a 2012 copyright. Hi John, don't know. Sorry. Down to the giveaway team. Download site will not connect. Have tried many times over 6 hour period. Have you checked the FAQ's, which I link to in my review @ comment #1 Your security could be blocking the site or internet explorer may be offline. If you use Firefox or Google Chrome you still need I.E. to be online to download from the giveaway site. Downloaded fine, but when I try and play it, it starts for two seconds, then closes, but it's still running, although the game is just the main black screen. Have you checked the FAQ's, which I link to in my review @ comment #1 There's a section on black screens. Could be you need to update your driver. Also try changing your screen resolution. If those don't work, post the issue in the forums. The giveaway is almost over, so hardly anyone will isit this page. The game will have registered, we just need to figure out what the problem is. check your event logs immediately after trying to run the game. Logs often help identify the problem. I think I played this longer than normal for my first time! It downloaded fast on 8.1. The graphics are very good as with the train ride etc. gathering and using items. The map is a big plus for traveling, since you do go back and forth! Thanks for another great game! Another fantastic game! It took several tries to successfully download it though. Thank you Game Giveaway Of The Day and Alawar Entertainment/Big Fish Games! Eternal Journey: New Atlantis was easily installed and runs very well on a six-year-old Win 7 machine with only integrated graphics. The graphics of the game are very good, and the game includes lots of video clips and animations. The volume of the musical score and the game sounds can be adjusted to the player's preferences. I hated this game. Although it runs well and everything works, I found the game extremely boring. The story line seems not worth following, and the puzzles and HOGs are just too easy. This game is played mostly by just following the instructions given by the hint button; it isn't possible to figure out what to do without using that green button. I can't imagine who would actually enjoy playing Eternal Journey: New Atlantis. The game is too complicated for children, and, at the same time, too simple for adults. This game doesn't have short segments that one can complete so that one can exit and come back later. There's nothing to learn and nothing to laugh at, and one doesn't become at all involved in this game. Eternal Journey: New Atlantis seems like a game that must have been created under contract by people who just wanted to deliver a package and get paid. At least it doesn't have to be uninstalled; I can just delete the game folder and be rid of Eternal Journey: New Atlantis. Downloaded within a minute, installed without problem on Win8 - beautiful graphics, nice storyline - I like it very much! Same thing happened to me! I looked threw the faqs and did not see anything that showed how to solve this problem? Did not see a link. Hi Oni, did you check your event logs to see if there were any log entries that may shed light on the problem? Had no problems with the download or install. Game ran smoothly and was actually quite excellent. Good story line, interesting enough that you want to figure out the ending. Puzzles are decent and you can quickly zip from one room far away with your map. I could see the diver thing coming a mile away but all in all it was really really good. I love that we have another adventure game! I can't get enough of these. This one is easier than some, perhaps just a tad too easy. Having the map tell you where things still have to be done is a major help---I can't always keep track of "where did I need to use this again?" ---but that, coupled with a very generous hint system (which I hardly ever use, but it's nice when it's there) makes this smooth sailing, and I do try not to use these if possible to increase the challenge. The puzzles aren't hard and some are just a bit tedious, but OTOH I hate when puzzles are so hard once in a while that I have to skip---I never want to do that! What can I say, WR, I just love adventure games and wish there were a single source for tons of freebies of these. But then I'd never get any work done! Great game this week after weeks of disappointment with either something I really didn't care about or games I already had. Downloaded in less than a minute and a half, installed fine on Win7Pro 32/64. Plays very smoothly. Lovely game. Graphic are really nice, game flows well, and one of the few games I actually like the music and other sounds. Well done....usually the music on games annoy me....this one is actually soothing and fits very well into the game play. Love that is is more adventure with some puzzles. Really dislike games that are just one hidden object after another with no story. This one has a very good story so far. Am half way through the game and looking forward to the rest. Hope I can find all the electronic thingies to get to the bonus! Very good game overall and have no complaints. Hope to see more like this in the future. Love adventure games without all the violence that is in most of them. To be honest there are too many game deals around too list them all. Why is a proclamation of one's honesty required. Is dis-honesty otherwise expected? Frank, it's a figure of speech. Where I was born and lived till early adulthood, it was used frequently. I'm sure there are phrases used throughout the world that are regionally based, so it may seem strange to you, but not to me. Why pick on this when these comments are meant for game discussion? Beware, I had trouble with this game on my Win8 64bit tablet. I had to punch a button 18 times before it registered and did the action it was supposed to like open the options screen or exit the game, and especially for an HOG that would drive me batty. I am downloading it on my win7 laptop as I type. So if you are downloading for Win 8 or a touch enabled tablet check it and make sure it works before the offer is over. Thank you for your feedback Gina. Beware, I had trouble with this game on my Win8 64bit tablet. I had to punch a button 18 times before it registered and did the action it was supposed to like open the options screen or exit the game, and especially for an HOG that would drive me batty. I am downloading it on my win7 laptop as I type. So if you are downloading for Win 8 or a touch enabled tablet check it and make sure it works before the offer is over. .....................................Moderator Comment......................................... Thank you for your feedback Gina. Well, for this game, I did download it from Big Fish Games, since I had a game credit. I used that and it D/Led and installed perfectly! Didn't have to turn everything off to do so. Up until about a month ago, I never had any problem D/Ling a game from you. Even then and before, I never had to turn off anything or clear the cookies/cache. So, since I was able to get this fun game from BFG, we'll let it go and see what happens next weekend. I've had problems installing most of the games recently until i turned off zemana antilogger. Am I correct that to uninstall you just have to delete the folder in games? Hi, Fabulous Game! I like the feel of it straight away. Great graphics, in relax mode no-nonsense hint button allowing to get on with game's flow and other 'helping hands' aiding the traveller of this Adventure with intelligent guidance rather than making him/her stuck, annoyed and lost beyond reason. I sense there will be enough puzzles and conundrums on the way to figure out what next, how, where and why. Nice new detail - objects when found jump to the scene and not from it to the list in window, sweet and different:) Only just started, but would like to give it thumbs up and thanks for this lovely Gift and another great Presentation! So glad it's not a 'teaser' of last week, when Collector's Edition (Living Legends of Ice Rose) left people disappointed that it wasn't and wondering what they missed..(me? - went and bought the darn CE version in the end:) Happy Mother's Day to all Mums and Loving Ladies in UK! A very big download again, but it went smoothly enough. The game unzipped without problem (Windows 8.1) and opened as expected. The graphics are very good, and it has a story - with a female hero, as so often happens these days - which will no doubt develop when I get a bit further into it. I only had a brief go at this one for now, and as usual my sound was turned off, so I can't comment on that. But it looks good, and potentially interesting. The hints are clear (so far) and you can see where they're going. So it's a thumbs-up from me, and I expect the other member of the household, who plays these games more than I do, will enjoy it. Just one little warning - when I switched on my sound for a moment (just to make sure it worked), the cat in my lap leapt about six feet into the air. It's very loud! You may want to turn it down from maximum to a more bearable level on the Options screen before you turn on your own computer sound. You can always adjust it later. Thanks once again for the game, Alawar, GGAOTD and Whiterabbit! A very big download again, but it went smoothly enough. The game unzipped without problem (Windows 8.1) and opened as expected. The graphics are very good, and it has a story - with a female hero, as so often happens these days - which will no doubt develop when I get a bit further into it. I only had a brief go at this one for now, and as usual my sound was turned off, so I can't comment on that. But it looks good, and potentially interesting. The hints are clear (so far) and you can see where they're going. So it's a thumbs-up from me, and I expect the other member of the household, who plays these games more than I do, will enjoy it. Just one little warning - when I switched on my sound for a moment (just to make sure it worked), the cat in my lap leapt about six feet into the air. It's very loud! You may want to turn it down from maximum to a more bearable level on the Options screen before you turn on your own computer sound. You can always adjust it later. Thanks once again for the game, Alawar, GGAOTD and Whiterabbit! Oops! Forgot to mention that "Big Fish" is having a sale on all their games; "Collector's Edition" games are marked way down through the end of the day only. Not sure I understand how "Big Fish" ends up being the "Homepage" for an Alawar game? Regardless, "Big Fish" is having a sale if you're interested in buying "Eternal Journey". I don't usually rate games, one way or the other, unless I've already played them, but I give Eternal Journey a huge thumbs up. I played the trial, some time ago; liked it and bought the "Collector's Edition". It is worth every penny, in my opinion; one of the top five HOG's I've ever played - one of the top two in fact. I don't buy many games because I'm financially challenged, but if you like "Eternal Journey" then I highly recommend getting the "Collector's Edition"; it is well worth it. The "Collector's Edition" has extended play and a built in guide to help you along the way. Enjoy "Eternal Journey"; I did. I don't usually rate games, one way or the other, unless I've already played them, but I give Eternal Journey a huge thumbs up. I played the trial, some time ago; liked it and bought the "Collector's Edition". It is worth every penny, in my opinion; one of the top five HOG's I've ever played - one of the top two in fact. I don't buy many games because I'm financially challenged, but if you like "Eternal Journey" then I highly recommend getting the "Collector's Edition"; it is well worth it. The "Collector's Edition" has extended play and a built in guide to help you along the way. Enjoy "Eternal Journey"; I did. It downloaded fine and installed and seems to work more or less. Strangely when I entered a player's name it recorded backwards. I play as JR but when I typed JR in it was listed as RJ. Wierd. Otherwise the game seems to be OK and interesting (based on 5 or 10 minutes of play. Thanks to GGOTD, Alawar/BigFish and you for this offering. I have successfully downloaded but won't be playing it right away because I have some things to do today. Based on your review and the videos, it does seem like a nice game with some uncommon twists, so I expect I will enjoy it. Hi Cara, I'm sure you'll enjoy it. I played for about an hour early this morning and thought it a worthwhile giveaway. Just love these HOGs , the only ones my wife lets me put on her computer. Thank-you very much and for the two walkthroughs. downloaded great no issues at all.the game looks to be very interesting thank you once again gg for a wonderful game !! .......removed, language not suitable for a family site...... online ! No thanks 516MB !! Hi Visor² each to their own. why do you not like these games? 80% of the community voted yes for this game and there was well over the average number of downloads (21200). Yes, it is set to online working. When it opens, it is using BING as my homepage. So it is connected to working online. It could be your own security software. It may be seeing the setup.gcd file as a threat a sit uses Themida as part of its coding. Altohugh not recommended, it may help to turn off your security temporarily while you download and install the giveaways. As soon as they are registered turn your security back on. The game giveaway project has been live since december 2006 and had never given away a game infected with malware, so I'd say its very safe. I did open my email to get to the link through IE and also the same email through Firefox. Yes, I do use FF as my norm. Please disregard my previous inquiry re: trying to connect to D/L the game. I saw there was a link to Big Fish homepage and I just remembered that I have game credits there I can use. Just finished D/Ling it and installing it from there. I just don't understand why all of a sudden I can't connect to games that you're offering. I've been able to connect all these years and now as of a month or so ago, it won't let me. If you have ANY suggestions for me to try, they'd be most welcome. Thank you, Stephen, for all you do for us. Hey! I just realised that I didn't collect all 18 of the digital media thingies... anyone know if that would have opened up extra gameplay if I'd noticed before exiting? I'm trying to connect with the link to download the game. Neither IE nor Foxfire will connect. (The little busy icon just keeps spinning). I deleted the GGotD cookies, temporary turned off my antivirus and STILL it won't connect. Is there another link I can try, please? I have WinXP. If you use firefox normally, make sure that I.E. is set to online otherwise you won't be able to connect. That was a very pleasant & refreshing HOG variant. The majority of the graphics and audio were well done and some of them very realistic, adding much to the ambiance and also the game's ability to keep you playing for 'just five more minutes' - that was how I ended up playing for several hours anyway, and I was quite disappointed to realise that I'd completed the entire game! The only drawback I would say, is that it could be longer... perhaps they already have the next edition available? That was a very pleasant &amp; refreshing HOG variant. The majority of the graphics and audio were well done and some of them very realistic, adding much to the ambiance and also the game's ability to keep you playing for 'just five more minutes' - that was how I ended up playing for several hours anyway, and I was quite disappointed to realise that I'd completed the entire game! The only drawback I would say, is that it could be longer... perhaps they already have the next edition available? Nice game! I had played the demo at some point & was considering buying it. Everything worked fine for me. Win 7, Home Edition, 64 bit, Intel G45/G43 Express Chipset. I really can't think of any changes to make. I played until just after the time jump. Did you mean that fix with safe mode ? Program installed and activated but can't be executed ... no (error)messages will appear ... i retried downloading and installing and executing it 3 times already same result .. who can help ? Two lovely games two Sundays in a row! Unfortunately for me, I already own both of them. Darn! The rest of you enjoy, definitely worth the download. Wow! 516 Mb download - 30 minutes on high-speed! And another HO-trash - really great! Over 21 000 downloads and a positive 80% votes says you are wrong. Just because you don't like HOG's (I assume), doesn't make them trash.